THERE ARE SO MANY HOTTIES. Thor (Chris Hemsworth) is imprisoned on the other side of the universe without his mighty hammer and finds himself in a race against time to get back to Asgard to stop Ragnarok—the destruction of his homeworld and the end of Asgardian civilization—at the hands of an all-powerful new threat, the ruthless Hela (Cate Blanchett). But first, he must survive a deadly gladiatorial contest that pits him against his former ally and fellow Avenger—the Incredible Hulk (Mark Ruffalo). OH MY GOD, there are SO MANY HOTTIES—male AND female! You'll also be laughing SO HARD. That's a promise! Aside from playing the God of Thunder, he was also in 2016's Ghostbusters, as the adorable hottie Kevin. Paramount Pictures announced last year that he'll be returning to the Star Trek franchise as George Kirk. She was Galadriel in all six Lord of the Rings movies, and she's also played Queen Elizabeth I twice. Here's another Lord of the Rings alum! After playing Eomer, he went on to play Bones in the Star Trek movies. He was most recently seen in Kong: Skull Island, but a lot of ladies absolutely adored him in The Night Manager in 2016. Don't worry, he'll be back in Avengers: Infinity War in 2018. Aside from playing the green guy in four of the Marvel Cinematic Universe movies, he was also in Now You See Me 2 and Infinitely Polar Bear. But you probably remember him best from 13 Going on 30 in 2004 with Jennifer Garner. He's been playing a murder detective in Luther since 2010, but more recently he was Roland in The Dark Tower and Stacker Pentecost in Pacific Rim. Fans of Veronica Mars might remember her as Jackie Cook, but more recently she was in HBO's Westworld and Creed with Black Panther villain Michael B. Jordan. You've actually seen him as the Grandmaster before—in Guardians of the Galaxy Vol. 2! But you might remember him best from the Jurassic Park movies. You saw him in HBO's Westworld as the terrifyingly brilliant Dr. Robert Ford. Before that, you probably grew up seeing him in all sorts of movies: The Silence of the Lambs (1991), Bram Stoker's Dracula (1992), The Remains of the Day (1993), The Mask of Zorro (1998), Beowulf (2007), and Transformers: The Last Knight (2017). This beautiful man and his cheekbones have played many iconic and historical characters: Sherlock in the eponymous BBC series (2010 onwards), Khan in Star Trek: Into Darkness (2013), Alan Turing in The Imitation Game (2014), the dragon Smaug in The Hobbit: The Battle of the Five Armies (2014), and Stephen Hawking in Hawking (2004). Spot the cameos: Sam Neill, Chris' older brother Luke Hemsworth, Matt Damon, Zachary Levi, and Ray Stevenson! They're on-screen, though, for like less than a minute. This is the closest we're ever going to get to a standalone Hulk movie in the Marvel Cinematic Universe. This is because Universal bought the movie rights to the Hulk in the 1990s. If Disney makes a Hulk movie now, Universal would have distribution rights, and apparently, no amount of negotiations has been able to make that happen. As seen in the trailers, Thor: Ragnarok adapts the Planet Hulk storyline. The green guy is stranded on a distant planet ruled by a tyrant and is made to participate in gladiator games for entertainment. With Thor and the Hulk being two of the most powerful Avengers, you can imagine how epic their fight can be! Watch for scene-stealing alien Korg, because he's played by the movie's director, Taika Waititi! The writer-director-actor is the genius behind the cult favorite What We Do In The Shadows, a mockumentary that follows the lives of three Kiwi vampires who are sharing a house—and domestic woes. A lot of the cast members are Australian (Chris Hemsworth, Cate Blanchett), Kiwi (Karl Urban), and British (Tom Hiddleston, Anthony Hopkins, Idris Elba), and that may have something to do with the fact that most of the movie was shot around Australia. 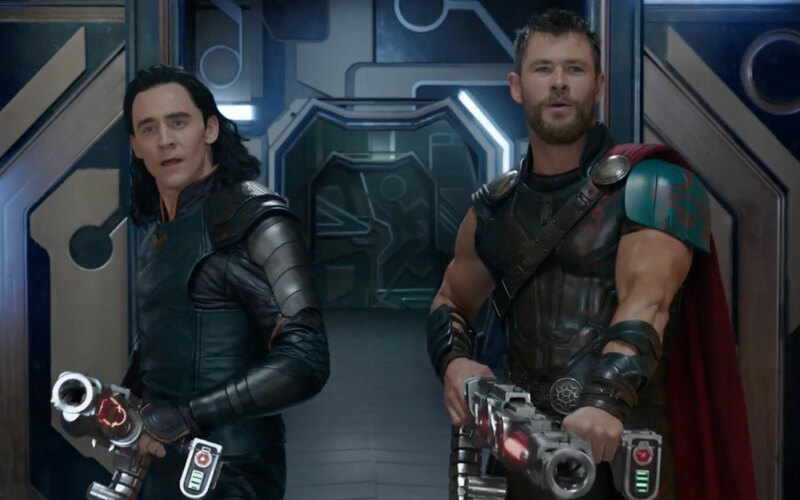 Thor: Ragnarok is like a really cheesy '80s action flick, down to its over-the-top action and slapstick humor. You get so many amazing, hilarious duos here: Hulk and Thor; Thor and Bruce Banner; Thor and Loki; Hulk and Valkyrie; even Hela and Skurge. The dialogue is funny AF and it feels like every cast member is suddenly a comedian—even Anthony Hopkins! Expect no life-changing epiphanies or deep Norse philosophy here. This is silly, ridiculous fun that will have you asking, "What were they smoking?!" It's great that the movie revisits characters and relationships from previous films, but the new characters are really fun, too! Dark goddess Hela isn't all gloom and doom—but also witty, sarcastic, and over-the-top villainy. Skurge is like that thug who really just wants a shot at the big leagues, but you catch him goofing off with his guns Des and Troy. Valkyrie could probably drink Volstagg under the table and kick both Thor AND Loki's (lovely) asses. Oh, and it's not just the cast that you'll want to look at. The whole movie is a psychedelic visual feast! Sometimes the scenes look like classical paintings come to life. As much as possible, watch the movie with a big gang of geeks who are also fans of the Marvel Cinematic Universe! Together you can laugh out loud and spill your popcorn, recognize gags and quips that reference the other movies and characters, and slap each other's thighs because you're both laughing so damn hard.